Ibis Novena is located near train station, Zhongshan Park, Mount Elizabeth Novena Hospital, on Balestier Road & minutes away from Singapore CBD & Orchard Road. The first International 3-star hotel in Novena, located near Novena Shopping Malls & great accommodation for Medical Hub. It features 241 stylish designed rooms with timber flooring, free Wi-Fi internet access, restaurant & bar and free parking. Free shuttle to Novena MRT station & Orchard road available. The best value 3-star hotel in Singapore. The IBIS SINGAPORE NOVENA HOTEL is a Tourist, Leisure hotel. Located in City Centre - Balestier area. Shopping is within walking distance and the nightlife/restaurants are within walking distance from the hotel. Descriptionclass="small" style="text-align: justify; font-size:11px;">Ibis Novena is located near train station, Zhongshan Park, Mount Elizabeth Novena Hospital, on Balestier Road & minutes away from Singapore CBD & Orchard Road. The first International 3-star hotel in Novena, located near Novena Shopping Malls & great accommodation for Medical Hub. It features 241 stylish designed rooms with timber flooring, free Wi-Fi internet access, restaurant & bar and free parking. Free shuttle to Novena MRT station & Orchard road available. 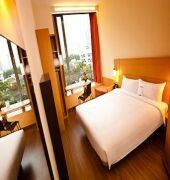 The best value 3-star hotel in Singapore.